The internal components of a urinal differ somewhat from a conventional toilet, but cleaning and unclogging the appliances is a similar undertaking. Over time, urine solids and minerals from hard water calcify and clog urinals, especially the waterless variety. Mechanical and chemical tools are available to remove the obstruction and return flow to the device. For safety purposes, wear protective clothing, including gloves, goggles and nonslip shoes when attempting to clear out a urinal. Clearing out a urinal is similar to clearing out a toilet or a sink. If the urinal is a flush-type outfitted with a standard P-shaped sink trap, a cone-type plunger is used to clear obstructions. Place the plunger over the drain and vigorously push the plunger down and up several times to clear out the urinal. Flush the urinal to determine if it's clear. If the urinal is the seal trap variety, place the plunger over the trap, and work the plunger until the blockage is cleared. An auger, or drain snake, features a semi-rigid spiral wire that is used to negotiate the bends of a drain to clear out a blockage. A urinal auger features a spring that is more flexible than a toilet snake to negotiate tighter bends. Feed the end of the auger into the urinal drain until it stops. Turn the handle clockwise while pushing and pulling against the clog or calcification to dislodge it. Reel the auger back in to remove it from the urinal. 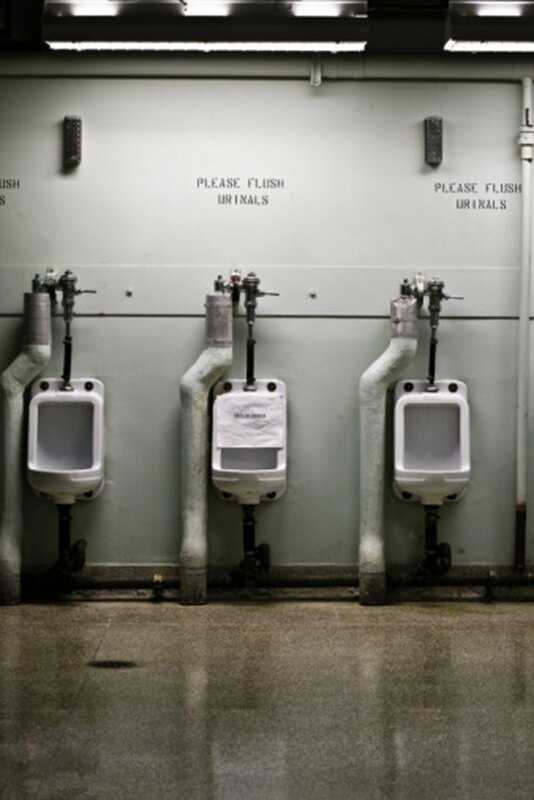 Sold as a "greener" option, waterless urinals use chemicals to block odors and conserve water. The chemical sealant is heavier than urine, creating a barrier by floating on top of the urine in the trap. Over time, however, urine solids sometimes clog the urinal. A water scale cleaner containing hydrogen chloride is used to dissolve the solids. Follow the package directions for slow-draining sinks, which generally recommend pouring about 1 cup of the solution into the drain and waiting 15 minutes. Flush or pour water into the urinal to clear it out, and repeat if necessary. Use vinegar and baking soda to clear out urinals and neutralize odors. Turn off the water to the urinal and pour 3/4 cup of baking soda down the trap. Pour 1/2 cup of white distilled vinegar over the baking soda, and cover with a rag for 30 minutes. The fizzing action helps dissolve deposits. After the 30 minutes have elapsed, remove the rag and pour 2 cups of boiling water down the urinal to clear it out. Repeat if necessary. Since 1992 Bridget Lewison has worked in practically all aspects of the newspaper business. Her work has appeared in "The Pasadena Star-News," the "Inland Valley Daily Bulletin," the "Mohave Valley Daily News," the "Kingman Standard," the "Arizona Independent" and the "Las Vegas Tribune." Her work also has been distributed by the Associated Press. From 2001-03 Lewison ran Pitzer College's public-relations office. What Do You Use to Clean the Overflow in a Bathroom Sink?